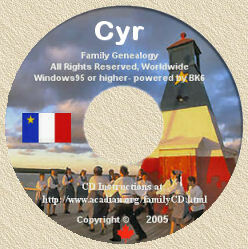 Acadian Genealogy Homepage; History of Heraldry! The History of Coats of Arms, as we know them today, dates back to the time of the signing of the Magna Carta, 1215 A.D.
During the feudal wars, where one family and their followers joined a noble or their king, it was difficult to distinguish friend from foe. In the heat of battle, concealed by armour, and charging with his lance tilted at his enemy, a knight needed quick identification, hence a brightly coloured shield, a crest on his helmet and horse draped (or mantled) with the colour of his allegiance. In 1484, King Richard appointed a Royal Herald so that Arms could be listed and officially recorded and passed with pride from father to son. Coats of Arms became so numerous that a College of Arms was formed to protect devices awarded for valour, and to avoid duplication. The College of Arms is still, to this day, the only authority to sanction the right to bear Arms. A record of all Coats of Arms was compiled by the King of Arms, Sir Bernard Burke, and it became known as Burke's General Armory, probably the world's foremost authority today. Later the Family Coats of Arms were used to decorate the family silver, precious heirlooms, even the family church pew. Why, some people (yours truly) even used it as a background in his "Acadian Genealogy Homepage", on the World Wide Web of the Internet! Pride in one's heritage became paramount and frequently, the only way of tracing one's ancestors was through the entitlement of Arms. Shields bore marks of distinction for the first son, the second, the third, even the eight son. From nobility to esquires, from commoners to kings, Arms became family identification which supported the Bards (official record keepers and historians) who told their story in rhyme and song (to help their memories), whilst the family clan sat around the camp fire, or castle keep, and cherished the thoughts and deeds of their forbears. Mottoes, originally a battle cry, became family watch word. In times of peace, Coats of Arms were proudly displayed in the majestic splendor and pageant of the jousting field, and entry of each knight or squire, was "heralded" by a fanfare of horns accompanied by the Royal Herald announcing the name of each knight by reading from a parchment scroll, much like a town crier. The ladies waved their favours (usually a small scarf, the same colour as her chosen knight's cloak). The sport was not as bloody as it seemed and it was unusual for a knight to die on the jousting field, although there have been rare instances when even a king was killed in a joust. Today the sport of jousting is being revived, along with family name Coat of Arms. In fact, there have been more Coats of Arms granted in the past few decades, than in the whole of middle ages. The language of the art is still the same as it was many hundreds of years ago, and although it may seem complex, just as a doctor's prescription, it makes error almost impossible. However, family name Coats of Arms should not be confused with personal arms. These are granted to an individual who has the sole right to bear them. But there is equal pride in family name Coats of Arms. What do coat of arms mean? Wars were almost a continual occurrence during the Middle Ages, and so more and more armour was added to a knight's battle uniform until he was finally protected from head to toe. It was virtually impossible to tell one knight from another without some visible means to identify each knight. Consequently, to prevent any knight from spearing his friend on the battle field, they initially painted colourful patterns on their battle shields. These patterns were eventually woven into cloth surcoats which they wore over their suit of armour. In fact surcoats with the same pattern were worn by their horses. As more design were created, it became necessary to register or copyright them, to prevent two knights from using the same insignia. In many cases, were kept, then compiled, listing the family name and an exact description of its coat of arms.These are called armourials or blazons. The word heraldry is associated with coat of arms. Tournaments (or jousting contests) were common during the days of knighthood, and as each soldier was presented at a tournament, a herald sounded the trumpet, proclaiming the knight's achievements, and described his arms.